Please do not return control of Calif Prison Medical and Mental Health to the State of California. 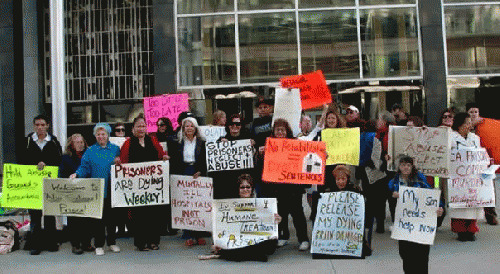 Please grant full media access to prisoners so that the cover-up and abuse can end. Please find a way to keep a federal monitor involved. We understand that at 81 years of age, you more than deserve the right to retire. No one made more of a difference in the pursuit of liberty and justice than you have in bringing the California Prison system under Federal Receivership. You have been heroic beyond words. Sadly, the money has been spent but the attitudes of State Prison employees have not changed. The riots, preventable deaths and multi-million dollar taxpayer lawsuit pay-outs continue to mount unnecessarily. Now they want to build more prisons instead of changing harsh sentencing laws, all so that CCPOA can have job security. Retaliation against prisoners who file a complaint exposing abuse, neglect , psychological torment, deliberate indifference or a wrongful death has intensified. There is a problem with judicial integrity and separate campaigns have been launched because prisoners are mostly being denied due process. For example, the Men's Advisory Committee (MAC) members at Sierra Conservation Center in Jamestown, CA have resigned due to abuse of inmate paralegal Eric K'napp for filing complaints on every prisoner's behalf of rogue guards. It is very clear that any MAC member who does an honest job of representing inmates will be harassed, degraded, lied about and given "Deisel therapy." K'napp was sent out of SCC without a medical hearing to a Level 3 facility when he is Level 2 and his doctor was over-ruled and disregarded. The MAC group appeal of visiting problems was seized by the out-of-control prison guards with blatant violations of ADA laws. The Warden Heidi Lackner is retiring in October and she has lost control of the guards. There is falsification of records and statements which is still business as usual at SCC and at most of the State Prisons. Also at SCC in Dec. 2013, inmate Andrew Tisnado was left unsupervised in a dorm and attacked. It took more than three hours to transport him to a hospital, he was alive and combative but too much time went by and he died. This is supposedly the best prison, but the truth is that it is the best prison at covering up. I don't know how they met criteria to be certified by ACA except by lying. The media has been so severely restricted since 1996 and the prisoners and families so intimidated about reporting abuses and deaths that you might not be seeing all that is actually taking place, which is opposite of your judicial orders. Couldn't you order full media access to inmates to be returned to the media to stop the cover up? There is no real place for prisoners to go in a life and death emergency for help. While some public servants are well-intended, the lawmakers especially seem to have no power over the bullies who run the prisons. I'm not saying that Receiver Clark Kelso was ever very helpful to the fathers, mothers and other family members in this photo taken in 2008 outside your courthouse in San Francisco after ten years of attending hearings trying to clean up the mess. It was taken on the day that you appointed the first Federal Receiver, Robert Sillen, also basically callous to the families. There are thousands of cases of daily abuse and neglect, intentional careless double celling by guards and prison administrators, and many wrongful and preventable deaths. The psychological abuse is indescribable, certainly not on a par with Norway where people are treated as human beings and return to their communities as much better citizens. Surely there is a way that you can retire without putting this mafia-like, profit-driven, law enforcement labor union gang back in charge of the prison medical care where they operate with impunity. There is still a high death toll and all Governor Brown ever did was play musical chairs and transfer people around between facilities. He took millions of dollars in donations from the Prison Guard's Union in his campaigns to protect their interests and actual reform is now and has always been, very low on his list of priorities. Most of the people in this photograph are still together hoping for relief. Most did not receive help for their loved one. It will put all of our work and yours back to square one if you return oversight to the irresponsible and mean-spirited State bureaucrats. Please, please find a way to maintain some semblance of a federal receivership rather than lose precious ground because the problems are far from being over. Everything is done at most prisons to discourage visitors in order to cover up inmate medical and mental health mistreatment. Custody over-rules medical which is not what you intended. They are treated worse than livestock and even when a prisoner is near death, their family members are rarely notified. This punisher crowd has no manners and little humanity and do not deserve to have control of the prisons medical and mental health care. The cost to the taxpayers is outrageous but the human toll is immeasurable. Surely there is someone who can continue to hold the State accountable so that you can retire and reforms can continue to be made, we really hope so. and the suffering family members shown in the photo.